Ideal Tax Solution, LLC is analyzing the first report issued by the Low Income Taxpayer Clinic (LITC) Program Office detailing how LITCs provide pro bono legal services. Nationwide, thousands of low income taxpayers resolve disputes with the IRS through the efforts of LITCs. During the first half of 2012, LITCs helped taxpayers secure more than $3.2 million in tax refunds and eliminate nearly $6.5 million in liabilities, penalties, and interest. Ideal Tax Solution, LLC is sharing information it has received regarding how LITCs help low income taxpayers learn about their rights and responsibilities when dealing with the Internal Revenue Service. LITCs provide free or low-cost services to low income taxpayers who experience tax controversies with the IRS, such as audits or other tax liability matters. “During the first half of 2012, LITCs helped taxpayers secure more than $3.2 million in tax refunds and eliminate nearly $6.5 million in liabilities, penalties, and interest,” said William P. Nelson, LITC Program Director. According to Ideal Tax Solution, LITCs have been around for well over a decade, but this report represents the first time a study has been released since the program’s inception. “Although the LITC Program has been operating and helping taxpayers since 1999, this is the first time we have compiled a report describing the program’s activities and accomplishments. We are proud to provide this synopsis and demonstrate how the pro bono representation, education and advocacy efforts of clinics assist low income taxpayers,” says Nina E. Olson, National Taxpayer Advocate. Ideal Tax Solution closely monitors the effects IRS programs have on taxpayers across the board. The LITC Report provides an overview and history of the program, discusses the type of work the LITCs perform, and explains how their work helps ensure the fairness and integrity of the tax system. LITCs, their employees and volunteers operate independently of the IRS, although they receive partial funding from the government agency. Ideal Tax Solution has also learned the grant program is administered by the Office of the Taxpayer Advocate at the IRS, led by the National Taxpayer Advocate. The program awards matching grants of up to $100,000 per year to qualifying organizations to develop, expand or maintain a low income taxpayer clinic. 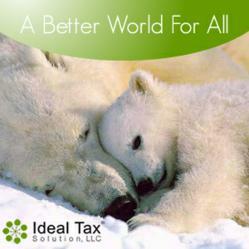 Ideal Tax Solution encourages concerned taxpayers to learn more about the LITCs in their area. For more information on LITCs or any tax related issue, contact Ideal Tax Solution or visit the IRS website.